Opportunities to own luxury waterfront property in Fort Lauderdale are fading fast. Fortunately, you can now own a piece of one of Fort Lauderdale’s original luxury residence sites, and bask in all of the amenities that put Fort Lauderdale on the map in the first place. Bayshore Towers, located at 511 Bayshore Drive is situated directly on the beautiful Intercostal Waterway, giving you the full exposure to the “Venice of the Americas”. Originally built in 1971, Bayshore Towers have been beautifully maintained, and now have one, two, and three bedroom floorplans available for purchase. 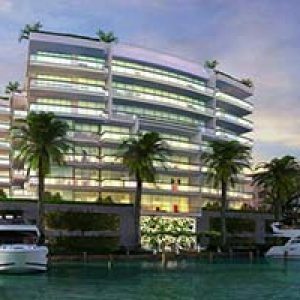 This 11-story, 64-unit tower puts you in the heart of Fort Lauderdale but offers up the seclusion and tranquility of a waterfront space. Units are available up to 1,400 square feet, just two blocks from the beautiful white sand beaches of Fort Lauderdale. Each and every unit at Bayshore Towers comes with an expansive balcony and outdoor living space, perfect for grilling, lounging, or entertaining guests. Floor-to-ceiling, impact resistant windows open up each room with natural light and takes advantage of beautiful Atlantic Ocean views. Sliding-glass balcony doors provide a seamless transition from living areas to outdoor spaces. Although most units have been recently upgraded to provide a modern, sleek design, all units are customizable to your own tastes and color schemes. Greet your guests in the expansive lobby, complete with marble floors and open, flow-through design scheme. All community members are privileged to enjoy the heated waterfront pool, surrounded by lush tropical landscaping. Get a workout in Bayshore Towers’ state-of-the-art fitness center, complete with a wide range of cardiovascular and weight training equipment. Relax and de-stress after your workout in the separate men’s and ladies’ sauna area. You can also entertain large groups of guests in the community clubroom and kitchen. If the weather is nice, take them outside and enjoy a barbeque on the pool deck. Management is always available on site for any needs you may have. Enjoy covered parking and assigned spots for all permanent residents and guests. Boat slips are also available if you or your guests are traveling by sea. Perhaps the best part about Bayshore Towers, despite being on the waterfront, is that it is just two blocks from the beautiful white sand beaches of Fort Lauderdale. Just a short ride from Las Olas Boulevard and The Galleria, world-class shopping and boutiques are right at your fingertips. You’ll also be just a few miles north of Fort Lauderdale Beach Park, ideal for bird watching or relaxing by the sea. Easy access to I-95 means you’ll be able to get to Downtown Miami or Fort Lauderdale International Airport at the drop of a hat. This piece of established Fort Lauderdale luxury living will not last long, don’t miss out on this exclusive opportunity!